Planning an outdoor wedding doesn’t have to be complicated but there are few things every bride and groom should know and consider. Adorable Wedding Concepts has helped planning hundreds of weddings and we know the finer details to help in the lead up to the special day. Use our guide and insights from our years of experience to assist the planning of your outdoor wedding ceremony. Understand your venue restrictions – Every location will be unique and have different criteria for the use of their site. Visit our locations page for a run-down of some Sydney’s most popular outdoor garden wedding venues and restrictions they may have. Venue hire and access – Most inner city garden locations, such as the Royal Botanic Gardens, charge for lawn hire and vehicle access and have time restrictions for setting up and packing down. Be sure to take this into consideration when planning your outdoor wedding. 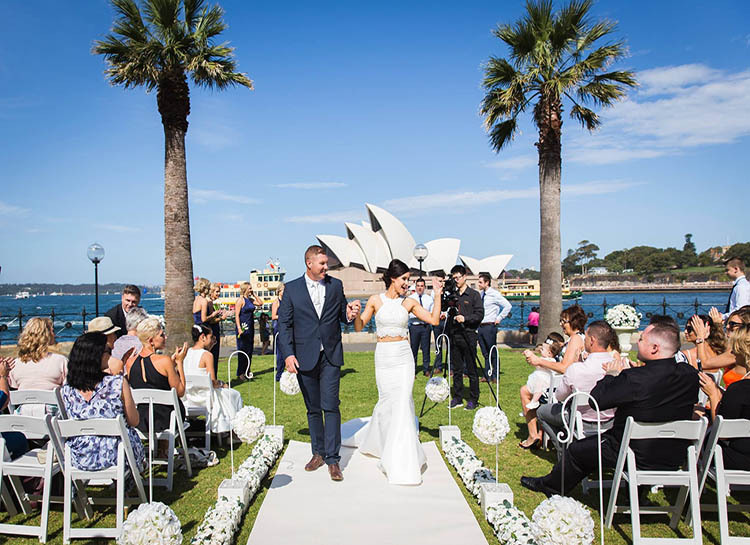 Have a wet weather plan – Mother nature can be unpredictable and Sydney’s highest rainfall occurs during the peak season for outdoor weddings (January to April). A wet weather plan can be as simple as booking our beautiful white umbrella’s for your bridal party and guests or an alternative location in case of rain. Utilise the landscape – Incorporating the beauty of the natural surroundings is a key reason for choosing an outdoor wedding, so don’t forget to use it. Don’t forget the water – Summer weddings can be hot so keeping your guests hydrated and comfortable goes a long way to maintaining a relaxed mood. Adorable Wedding Concepts has a drinks service available supplying chilled bottled water. Don’t forget the sunscreen – By mid-afternoon the summer sun can be scorching and most guests will not have thought about sunscreen while getting ready earlier in the day. Providing sunscreen will ensure there are no red face in the wedding album. For more information, be sure to send an enquiry or contact us directly on 0418 624 225. Take a look through our gallery for more ideas, decorations and styles. If you are considering booking Adorable Wedding Concepts for your outdoor wedding ceremony styling, be sure to book early to avoid disappointment as we book out fast during the peak season.